Despite hopes that European Union leaders would make some progress at the summit yesterday, we were left disappointed as they failed to all agree on a resolution. The ECB also cut interest rates by 25 basis points to 1%, although that could be said to have been already priced in by the forex spread betting markets. The overall effect on the euro - dollar spread betting market was a negative one and it shed around 75 points. This morning the pair is trading around $1.3325 and trending down along a bearish trend line. We see support at $1.33167 and resistance at $1.3370. Those traders who are spread betting on forex have been largely focused on the euro rather unsurprisingly and this morning the single currency is trading at $1.3420 against the dollar at the time of writing. Since the end of October the trend has been very much downwards for the euro, capped by a downward trend line but major support around $1.3200 remains in place. So key levels for EUR/USD to watch over the short term are $1.3485 and $1.3520 to the upside and $1.3350/00 to the downside with the bigger support seen at $1.3200 as mentioned. FX spread betting investors have been speculating on European policymakers expanding the funds available to indebted Eurozone countries, at the upcoming EU summit. The single currency moved higher against most of its counterparts, as the hope is that the summit in Brussels will provide clear steps as to how the debt crisis can be resolved. Along with this, the ECB is also forecast to cut interest rate from 1.25% to 1% tomorrow. This morning the euro is trading steadily higher against the dollar at $1.3437. On the economic data front things are a little quiet with the second reading of EU GDP due for release this morning which is expected to remain unchanged at 0.2%. Having said that, there is pressure to the downside, particularly following the terribly poor raft of PMIs that have consistently pointed towards contraction for many of the bigger EU economies. Spain saw output collapse recently to an almost three year low. The uniting of Merkel and Sarkozy in putting forward plans to give Brussels more control over regions deemed as careless, gave traders a much needed boost in sentiment. As a result, the euro rallied against the dollar and encouraged traders into more risky assets. However, then S&P ploughed in and inevitably the euro tanked and managed to close just 18 pips up against the dollar. This morning, is much of the same and the single currency is trading down at $1.3375. Fundamentals are playing a big part in this but, according to the technical analysis, the pair is trading in an intraday bearish channel which could signal further downside. Today sees lots of PMI service numbers released with the UK's expected to just about cling onto the 50.0 level. A dip below will mean that the service sector's run of expansion will have come to an end after 10 months on the trot. With the headwinds faced by UK businesses out there it'll be a close call come 9:30 London time this morning. Let's put it this way, if we had the snow like we did this time last year then we would probably see this number come in well below 50.0. The euro is showing a degree of life this morning as EUR/USD bounces off the $1.3400 level. At $1.3440 at the time of writing near term support and resistance is seen at $1.3340/05, $1.3255 and $1.3545/70. 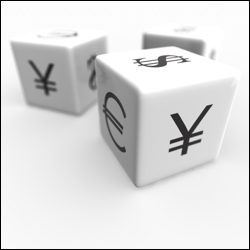 Forex spread betting investors are still in risk-on mode, and safer currencies like the yen and dollar might see their biggest weekly loss against the euro in over a month. Despite the ongoing threat of a Eurozone meltdown, US data has been positive recently and encouraging traders to look less at safe haven assets. However, today could be a big day for currency movement on the release of NFP. If the figures are good, it seems likely that we'll see equities move higher and a fall in the dollar. EUR/USD is trading at $1.3475 and sees support at $1.3460 and resistance at $1.3530. For the FX spread betting markets, the risk on attitude naturally led to dollar weakness across the board yesterday with both cable and EUR / USD making good gains. Cable got itself back above the $1.5700 level but this didn't last long and this morning we're back below at around $1.5650. Levels to watch to the downside over the near term are $1.5625, $1.5530 and $1.5490 meanwhile to the upside resistance is seen at $1.5775 and $1.5810. For the euro the single currency got itself back above $1.3500 against the US dollar but has also seen its share of weakness overnight taking EUR / USD back to $1.3440. Near term support is seen at $1.3395/60/05 and resistance at $1.3530/70. European finance ministers have also fallen short of being able to come up with a plan to boost the EFSF bailout fund to as much as €1 trillion. As a result, they are having to go cap in hand to the IMF, as well as explore other charitable donors who'll almost certainly be China and other emerging economies. This is forex spread betting markets are seeing the euro start in a negative mood this morning with EUR/USD dipping to $1.3275. The rally in recent days has definitely been proved to be short lived following a brief return back above the $1.3400 level yesterday. For the single currency support and resistance is seen at $1.3240/10 and $1.3395/1.3440 respectively. Yesterday morning saw forex traders regain some appetite for risk and buy into the euro, after the IMF indicated their €600bn Italian bailout package over the weekend. However, as we stated, the euro should be treated cautiously as it was a bear market squeeze and by mid afternoon the single currency gave back most of the gains it made against the dollar. This morning EUR/USD is trading marginally higher at $1.3335 and sees support at $1.3320 and resistance at $1.3410. Friday saw forex spread bettors flee the riskier currencies as Spanish bond yields traded near their record highs. The euro, was inevitably hit as nerves are still running high in the market over the bigger picture; the eurozone debt crisis. The weekend has been and gone and traders have returned with some fire in their bellies and ready to take on a bit of risk this morning. The IMF stated over the weekend that they are putting together a €600bn package which is designed to cover any potential Italian default. The news is pushing the euro higher against the dollar at €1.3315. Nevertheless traders should be cautious over this bear market squeeze.